Used Alfa Romeo 156 Review - 1997-2006 | What Car? 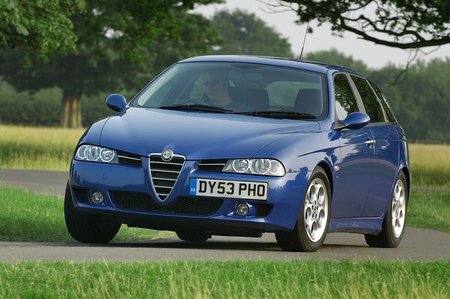 What's the used Alfa Romeo 156 estate like? The Alfa Romeo 156 Sportwagon is an estate for those who need something vaguely sensible, but want to cut a dash, too; dads with young families who still hanker after their sports car-driving youth, perhaps. It's certainly an entertaining car to drive, thanks to its range of capable, great-sounding engines, as well as wonderfully sharp steering. You do have to put up with an overly firm ride, though. The 156 Sportwagon is also a great-looking car, but those sleek lines mean luggage space is pretty poor for an estate. The rear seats fold, but the suspension turrets eat into the load area and the narrow boot opening doesn't make life easy when loading. The cabin is comfortable for passengers – in its day, the 156 won its class twice in What Car? comfort tests – and most models have climate control, electric windows, six airbags and a leather-trimmed steering wheel.